3,000 pages including every article from Ubuntu User! 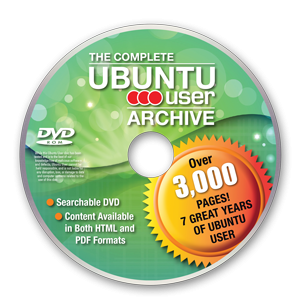 Don't miss this exclusive DVD release that covers all issues of Ubuntu User. You get more than 600 articles on everything Ubuntu-related, from games you can play, to servers you can run, to detailed instructions on how to build your own apps. The Complete Ubuntu User Archive includes all the articles you may have missed – for instance, compiling shell scripts to make them blazingly fast, how to make your programs execute processes in parallel, get a handle on systemd, and much more! Discover desktop applications that will save you time and simplify your life, and relive important moments in the history of Linux. All the issues on this DVD would cost more than €375 in our shop – but many issues are out of print. The only way to experience them is through the Ubuntu User DVD.